As you've probably discovered from reading my blog, I'm an avid tea junkie. While most Americans crave their cup of Joe each morning, I regret a day that goes by without a quality cuppa. I'm not talking about the stuff that comes over processed and minced in tea bags, but some good quality whole leaf loose oolong, green or white tea. I literally have two shelves of tea taking up room in my cabinets, not to mention another two rows of cups and tea devices. Tea has become my obsession and an indulgence really, which is why when I travel, I hate settling for whatever I can find. And now with Summer approaching the iced teas that are offered are often super sugary and taste like its made from powder, not tea. Luckily, when I flew to Orlando last month, I brought along with me a tiny Steep & Go adapter for only $6.95. It is designed to easily cold-brew loose leaf tea on-the-go. It fits on disposable Dasani and Evian water bottles making it super travel-friendly. It's also a great alternative to ready-to-drink teas, which are full of sugar and sodium. I had assumed the tea leaves would go into the Steep and Go container, but instead, you put a few pinches of tea in the actual water bottle. The device then filters the water through the capsule without the leaves, allowing the tea to brew freely in the water and stay submerged throughout. It's so easy and smart! It also comes in purple and blue color options and is BPA free and reusable. To fill the Steep & Go, I brought along small packets of tea from The Tea Spot, a philanthropic and organic loose leaf tea company based in Boulder, Colorado. The company donates 10% of all profits to cancer wellness programs. Check out their tea selection here, but I really like their Boulder Blues, Keep Fit green tea (perfect for cold infusions) and White Peony Tea. Also, when traveling, try scooping tea into a day of the week pill box, that way you have a teaspoon of loose leaf tea for each day of your trip. Also, a great way to take loose leaf tea to work. While on a recent vacation, I spent some time reading about tea too. I had picked up a copy of The Ultimate Tea Diet by Mark Ukra, who discusses the history of tea and the health & diet benefits of the Camellia Sinensis plant. It was a fun and easy read. Basically, he recommends that dieters wean themselves off coffee by replacing it with any kind of tea that they like. Dieters can select from green, black, oolong or white tea and may consume it hot or iced. The main things to remember is that it must be real tea (not herbal or rooibos), you must drink a lot and avoid adding excessive amounts of sweeteners. I really think this has a lot of merit, because ever since I started having loose tea at work (5 years ago), I wouldn't feel as hungry and I felt better and noticed an increase in my metabolism too. Tea Trivia: Did you know that America (well technically it was The New World at that time) drank tea before the mother country? Yes, Asia was the first to brew tea leaves (camila sensis) and then the Dutch discovered the brew during their famous trade routes with the Dutch Indies Company and started drinking tea. They then had colonies in North America like New Amsterdam (now New York) and it was these colonialists who drank tea 10 years prior to the English. Interesting, no? We all assume the British are the connoisseurs, but we can say Americans were drinking tea before them. Tea bags, are also an American invention to contain tea leaves without having a teapot or other tools. 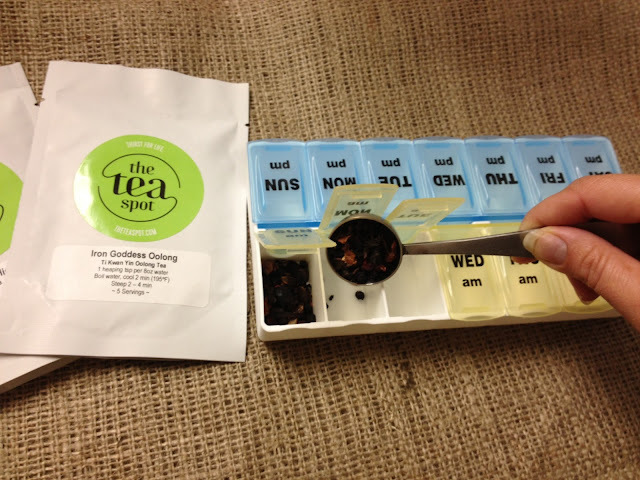 I absolutely love your idea for traveling with tea (using a pill box to portion out servings!) I read this post while traveling for work in Las Vegas and found myself wishing I'd known about this for that hot/dry trip!